Play as Caribbean Admiral who fight with pirates on see. One day came ghost pirates ship and has destroyed your fleet. You must start from beggining. Buy ships, upgrade and go to the battle. Try to win and earn money to buy better ship. Have a fun! 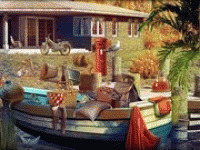 Choose related Caribbean Admiral game online.